Have you ever thought that you would like to grow a garden but you don’t have a lot of time to devote to it? Maybe you’re a parent who wants to feed your family fresh-from-the-garden veggies, or maybe you’re looking for a way to add some simple additional income to your budget over the summer. In any case, starting a garden for personal use or for profit can be extremely simple when you know which ones are easy vegetables to grow. 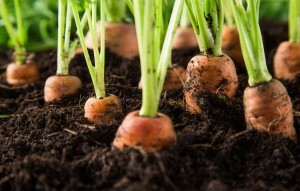 Root vegetables can be low maintenance because most of their hard work happens underground. Quick and easy to grow, even from seed, carrots can be sown directly into the garden. After planting in carefully tilled soil (rocks or dirt clods will cause your carrots to be crooked and gnarly), be sure to separate root balls after you see two sets of leaves popping up above the soil. This allows the plants to be separated appropriately and gives them the space they need to develop fully. A quickly growing herb, basil is well loved for its contribution to Italian cuisine as well as many other varieties of cooking. Because basil is able to be harvested quickly, you can gain a crop that can be used (and sold) in as little as two weeks’ time. Basil also works very well dried, so if you find yourself with a bumper crop, it won’t go to waste. Another leafy green that grows easily, lettuce comes in a variety of different types. Iceberg and other lettuces that have a “head” will take longer to grow than leafier lettuces such as Butterhead or Leaf lettuces. If you plant lettuce alternately, you’ll find yourself with the ability to produce a continuous crop for many weeks throughout the summer. Fresh salad every day! A spicy, crunchy, tasty additive to summer salads and vegetable trays, the radish is another root vegetable that does all of its work underground. Seeds germinate very quickly so you get a quick harvest. Do remember this little tip when considering planting times: the warmer the soil, the hotter the radish. So if you want radishes that are crisp but not too spicy, then grow in the spring and fall. Also, unless you pull them as soon as they hit maturity, radishes will get spongy in the middle—and no one wants that. Useful for spicing up a great number of ethnic dishes, garlic cloves are easy to grow and can bring in a hefty profit at the farmers’ market or from chefs at local restaurants. For cooler climates, plant in fall before the first frost. Warmer climates may need to wait until springtime to plant. Too much water isn’t great for garlic, so water only if the soil is dry two or more inches below the surface, also pouring water into the crowns of the garlic plant can cause moisture problems, so water the soil around the plant instead. These five easy vegetables to grow are the perfect way to get started with a simple and quick vegetable garden. And using a system such as Seed to Cash will allow you to take advantage of an expert growing process without support throughout. So stop thinking about it and get started growing!